Come see me play my very first show in Los Angeles at THE MINT! Tickets are $8 and the show starts at 9:15. I'm so excited to be playing this awesome venue and I hope to see y'all there. The Postcrypt Coffeehouse at Columbia University is a great place for singer/songwriters to share their music in a simplified, acoustic way. It's a perfect fit for me and Corinne and we'll be the JANUARY 23rd @ 8:30 sharing our music and listening to other great new artists. Join us! Doors open at 8. 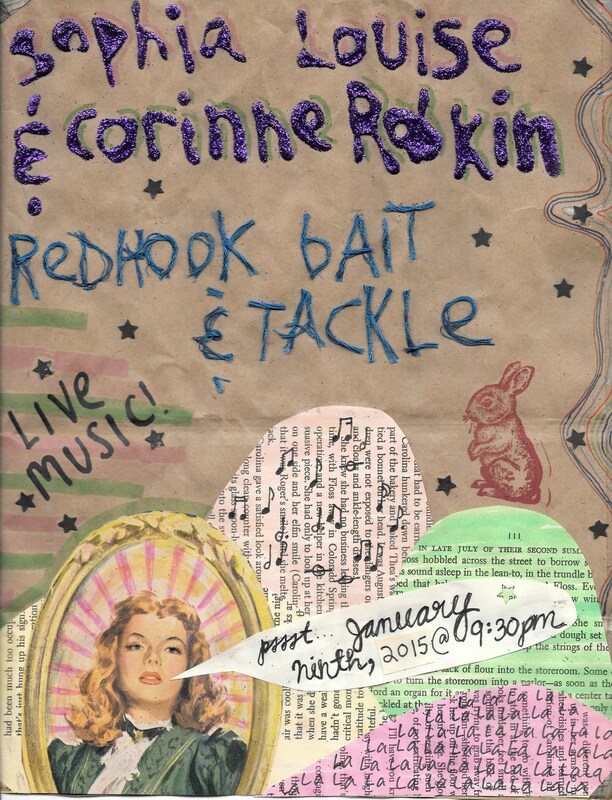 Corinne and I will be heading to Red Hook and so should you! Red Hook Bait and Tackle is letting us take over on January 9th. It's going to be all us, all night. So take the bus, join us! We'll be putting on a great show and you won't wanna miss it! Selections from my first original musical "Annabell & Bet" will be presented as part of Mohawk Fest this weekend at Cloud City in Williamsburg! There will be scenes and music from the show, as well as other new works by other awesome people, all created at the Mohawk Arts Collective this past summer. Tickets are $10 and the show starts at 7PM. Come out and support new theatre! Corinne and I are at it again! Check out our show at Pianos! I'm really excited about this one. It should be a lot of fun at this awesome NYC venue. There will be plenty of new original music, and if you haven't had a chance to hear what Corinne is doing on the accordion, you HAVE to come see! See you there! Corinne and I are heading uptown to play at Silvana on Sunday, Nov. 9th at 9pm. We'll be playing old favorites and new songs and covers we've been working on. Join us for a good time and we'll be hanging out after for drinks! Invite your friends! The show is FREE!!! Can't wait to see you there. Come join Corinne and I for a FREE night of music at Goodbye Blue Monday, a sweet little Brooklyn bar. Show starts at 9pm. The set is an hour. Bring your friends and we'll all drink and be merry together after the show! So excited to be performing We Run the Ship again in the city! This make-your-own-adventure children's musical with puppets and original music was written by Andrew Simon and Brittany Parker and I was lucky enough to be a part of their production at the Portland Fringe Festival! Now the show is back in New York where it began. The show is really fun for kids and their families and teaches about making choices with some messages about our environment not so subtly woven into the script. It's a really great time and I am so happy to be putting on my "Cap" cap once again. The show is at 1 pm at the Brooklyn Public Library. Hope to see you and any kids you might know at the performance! Come join me for a fun night of music and drinks at The Delancey on Oct. 6th @ 8PM. There's a $6 cover charge at the door. Bring your friends and enjoy the music! Come join me for an evening of original music, drinks and LOVE on Wednesday Sept. 10th, 2014 @ 7PM at the SIDEWALK CAFE! I will be heading to the bar after the set to hang out with the fans and sign body parts. See you there!